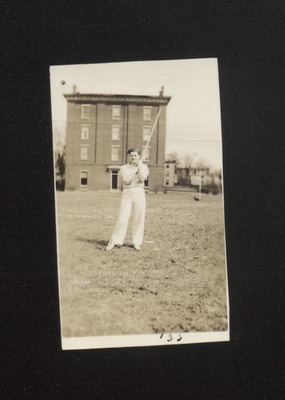 A Westbrook Junior College student stands in the playing field on the side of Hersey Hall in this sepia toned candid snapshot labeled '35 on the front. The young woman wears white bell-bottom sailor slacks and a white blouse/shirt with the arms rolled up above her elbows. She holds a long pole, possibly a vaulting stick. Her hair is short. On the back of the photo is written: In blue ink "Shirley Cole." In black ink: "April 1935."